Prominent & Leading Manufacturer and Exporter from Mumbai, we offer Cosmetology Medicinessuch as Botox Injection, Allergan Botox Injection, Latisse Injection and Juvederm Injection. 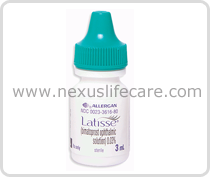 Uses:- Latisse Injection (bimatoprost) is a manmade form of a naturally occurring substance called a prostaglandin. Latisse Injection is used to treat hypotrichosis (abnormal growth of the eyelashes). Bimatoprost helps increase the growth, length, thickness, and darkness of eyelashes.